Property owners have a few different financing options available to them for energy efficiency improvements. An energy-efficient mortgage is a mortgage-backed (or “secured”) loan, which means that you use your property as collateral. Energy efficiency loans are unsecured loans, more like the personal loans or lines of credit that you can take out from a creditor. With an unsecured energy efficiency loan, you can borrow money from a lender to make energy efficiency upgrades to your property without having to use it as collateral. 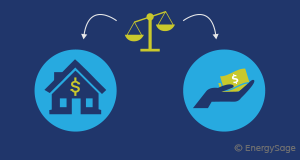 The penalty for defaulting on the loan is smaller – they do not require collateral, and the lender cannot foreclose on your home. However, they are also riskier for the lender than mortgage-backed loans, and this can result in higher interest rates. As with other energy efficiency financing options, you can find energy efficiency loans to fund a variety of projects. In most cases, these loans are better suited to large projects, such as replacing windows, insulation, or heating and cooling systems in your house, rather than small purchases like energy efficient appliances and lighting. What makes energy efficiency loans different? Each of your energy efficiency financing options, including energy efficiency loans, energy efficient mortgages, PACE financing, and on-bill financing, offer distinct benefits. Energy efficiency loans offer two distinct advantages over energy efficient mortgages: they don’t require that you put your property up as collateral, and applications can often be processed in the same day. If you don’t have equity in your home, or don’t want to use it, energy efficiency loans offer a good alternative. Additionally, depending on the financing provider, you may be able to receive an approval on the same day as you submit your loan application. When compared to energy efficient mortgages, energy efficiency loans typically offer slightly lower long-term savings. While this isn’t the only reason to conduct energy efficiency measures for your home or business, it is worth considering. There are two reasons why unsecured energy efficiency loans can cost slightly more in the long term than energy efficient mortgages. Unsecured energy efficiency loans don’t use your property as collateral and therefore don’t require that you hold significant equity in your home. However, if your loan isn’t backed by your property, it creates additional risk for the lender. 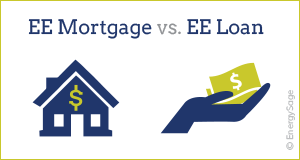 As a result, energy efficiency loans typically have higher interest rates than energy efficient mortgages. Additionally, unlike energy efficiency mortgages, the interest for unsecured energy efficiency loans is not tax-deductible. Energy efficiency loans can have terms running from five to 20 years. If you are interested in seeing the savings from your energy efficiency investment on day one, a longer loan term with smaller monthly payments is a good way to achieve it. However, you may end up paying more interest over the course of the loan as a result. Whether your primary motivation for energy efficiency measures is to reduce your electric bills, minimize your impact on the environment, or both, you should also consider installing solar panels on your home. As with energy efficiency, there are plenty of solar financing options, many of which are $0-down – and in many cases, there are financial incentives and rebates that can reduce your installation costs further. There are specialized home energy financing companies, like Renew Financial and EnerBank USA, that offer unsecured loan products specifically tailored to home energy improvements. In many cases, your energy efficiency contractor can connect you with loan options through these organizations or others. Utilities and local governments across the country offer similar programs – contact your state energy office, or your utility, to find out if there are options available near you.